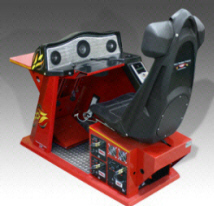 Home Pro Racing Simulator Arcade Machine - Sit back and relax in your very comfortable, real soft-leather seat and enjoy a totally immersive and realistic racing or flying environment in the first simulator system created and designed specially for home and residential use ! Enjoy all the latest racing, driving or other games for the PC, Xbox and PS platforms, while experiencing the most intense and exhilarating virtual simulation available ! Top-mounted Keyboard Tray (if using with a PC), along with RCA, Digital + Optical Jacks for external sound. the middle of the action on the race track, or whatever other games you choose to play on your new machine!! Best experienced with a large (36"-42") Dedicated Plasma or LCD monitor, it can also be connected to and placed in front of any existing flat panel or projector in your home ! Realistic Seating So You No Longer Have to Sit on the Floor ! Adjustable Pedals Seat Accommodate Most Sized Rides ! Imagine sliding into the cockpit of a Formula F1 race car with over 750 horses under the hood. You scream around the track at 220 MPH. Your body is rocked by the intense vibrations of the motor. You hug each curve tightly as your custom seat does its best to keep you from being thrown out. You reach to your side and shift into 6th gear- you're screaming now as you push the gas pedal through the floor. THIS is how you should feel when you race. THIS is how the HRS Pro puts you inside the game! You've spent months tricking out your new ride. You've got the horsepower, you've got the accessories and trim. You've got all of the custom parts and you want to feel it. The other cars rev their engines all around you and the adrenaline pumps through you. The car shakes like it's about to fall apart and you're being rocked with the intensity - then you slam it into first and squeal off the line as you're being plowed into the back of your seat. You grip the wheel with white knuckles as you swerve in front of a competitor, narrowly cutting him off. You crush the clutch and slam it into second as you eye the first corner up ahead. The sound of the guy you just passed comes roaring up from the rear left side of the car- he's catching up. You block the pass as you drift around the first corner at 92 MPH. THIS is how you should feel when you race. THIS is how the HRS Pro Home Racing Video Simulator puts you inside the game! Whether you're into Halo, Madden, Half Life, Warcraft, Fight Night, Hitman or ANY other type of game, you're going to be floored when you play in the HRS Pro. This machine rocks you with every hit. 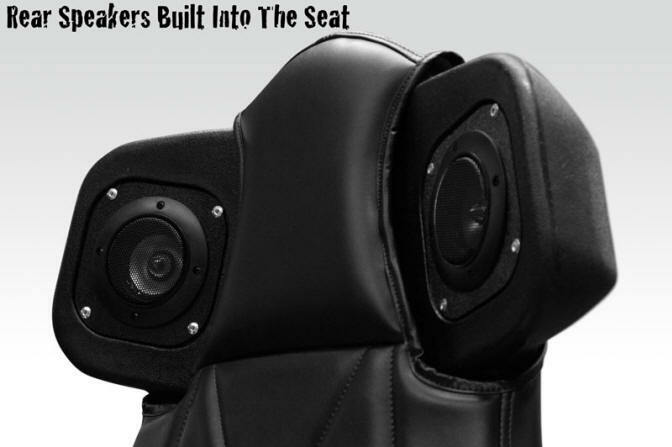 point all around you, coupled with HRS's super-powerful subwoofer system and seat shaker motors. A normal game turns into an extraordinary game. THIS is how the HRS puts you inside ANY game! 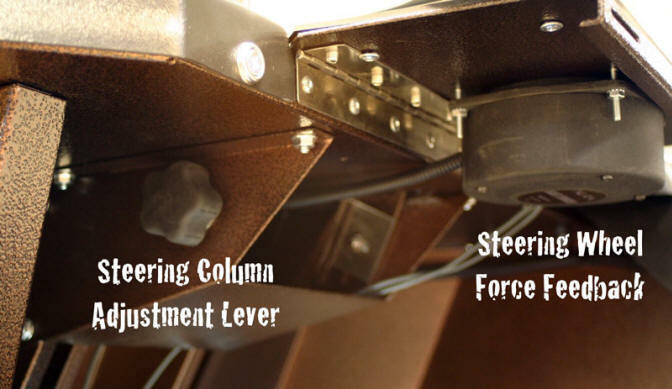 video arcade game racing simulation system created specifically for the residential market, and totally designed for a completely immersive and awesomely realistic racing environment within its top-quality commercial-grade industrial metal cabinet and housing built for years of carefree fun and excitement ! 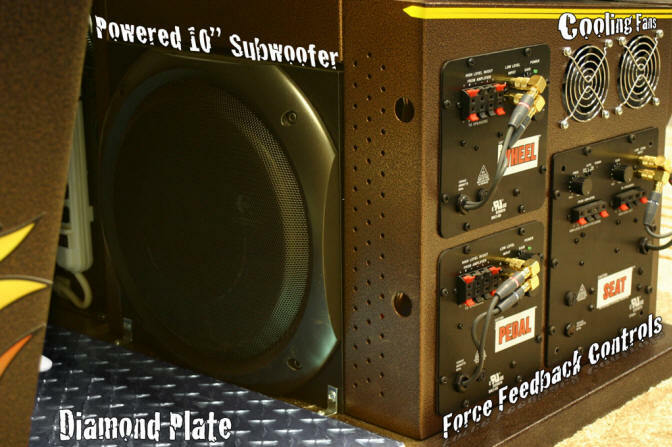 volume to all speakers (bass shaker units are controlled separately) and more! "double-duty" and actually be used as your DIGITAL SURROUND HOME MUSIC CENTER !!! right in the middle of the action on the race track or any other game you choose to play on it! It is unlike anything you have ever experienced in gaming, and you have to feel it in person to believe it !! of clean sound! In fact, the system can be turned up so loud (if you wish), that some BMI Gaming employees have even worn racing helmets and gloves for added realism, and yet hear everything like in a real race car! CAN BE LINKED USING XBOX 360? FOR REAL HEAD TO HEAD RACING COMPETITION !! THX? Certification : The absolute "seal of approval" for studio-quality speakers. It is the highest assurance that our speakers accurately recreate the full sonic experience of a actual movie theater. world that meets the rigid standards for unparalleled THX-Quality Approved Sound. decoder for full, rich, alive and interactive surround sound! levels approaching that of actual in-car racing experience (>115 decibels) if you so choose! Auto Digital Equalization : Actively adjusts frequency response in real time for the cleanest, most accurate sound reproduction. Amplifier: Ultra-linear, high-capacity analog. 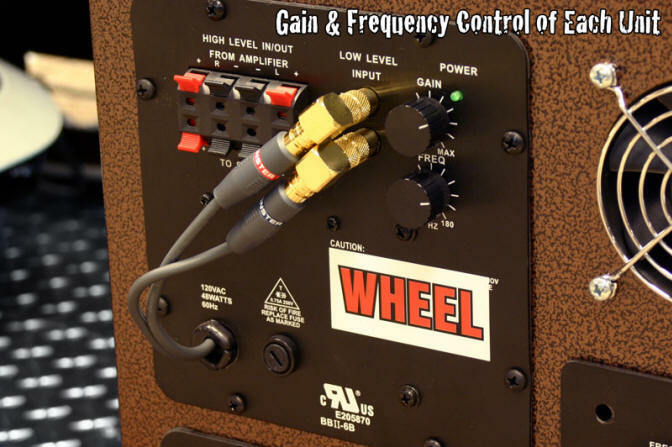 Signal to noise ratio: >93.5 dB, typical 100 Input impedance: 8,000 ohms. Hardware decoding for Dolby? Digital, DTS?, and DTS?, 96/24 soundtracks, Dolby Pro Logic II (Movie and Music modes). Never becomes obsolete, and can use all new and existing PC's and gaming systems! Can be easily moved anywhere in your house - Plus can use all your existing TV, Plasma or LCD displays! CRT TV, LCD or Plasma Monitor, or Projector Screen in your home, office or business. Custom colors and other customizations are also available - Please contact us for details! Q: How does the Home Pro Simulator work? A: The Home Pro Racing Simulator is designed to supply you with state of the art sound, seating, sensation and positioning for a real life game experience. By simulating a real-life cockpit through seating, surround sound, force feedback and instrument positioning, you'll get an amazing life-like experience by using one of our home simulators, no matter what gaming system you prefer to use!. Q: What colors are available for the home simulators? han our standard colored systems. Q: Are these machines only for racing? A: Not at all. Although the simulators are ideal for race simulation, they are also ideal for most other types of gaming, including Role Playing Games, Adventure Games, First Person Shooters, Flight Simulation, Strategy Games, Mass Online Gaming and much more. The keyboard tray allows for easy gaming for PC users. A mouse pad is built into the pro version. Q: Can the simulators be used for flight simulation? A: Definitely. Flight simulation yokes and rudder pedals can easily be mounted to the simulator for amazing flight simulation. Q: Are the simulators adjustable? A: Absolutely. We realize that many customers will use our simulators to entertain the whole family. With this in mind, we have designed our simulators with adjustable seats and pedals. For smaller gamers, you can slide the seat forward and the pedals up for comfortable gaming. For larger and taller gamers, the seat can slide way back while the pedals are put to the floor. Q: Is the TV/Monitor tray secure? A: Our TV/Monitor trays that sit in front of our simulators are completely secure. 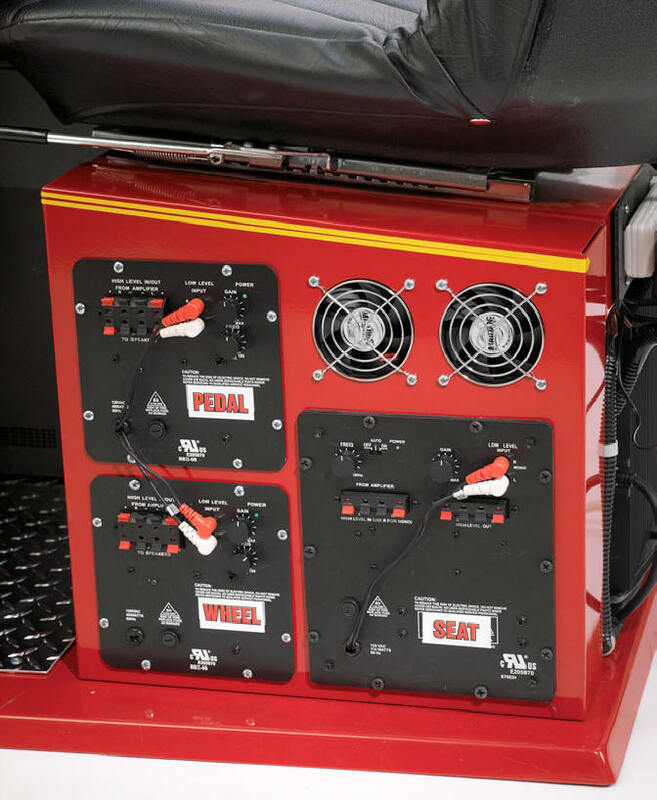 Not only are they made of thick steel but they are welded in place and then secured by an additional support arm underneath on our Pro Version. Our Sim Racer 4000 display stand is securely fastened then tightened down manually using hand turn knobs. These tray have been thoroughly tested with monitors ranging from 13" up to 52". We recommend that TVs & Monitors over 47" not be placed on the trays due to the proximity of the player to the screen. 37", 42" And 47" screens are ideal. Q: What if I decide to change gaming systems? A: No problem. 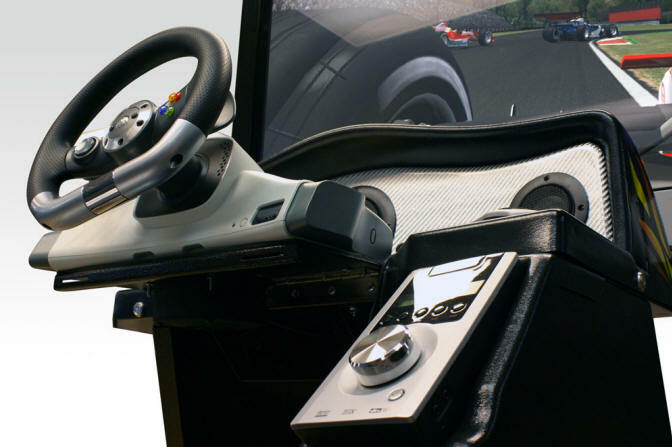 The beauty of the Home Racing Simulator is that it is completely upgradeable and future compatible. The simulator can be changed to use other systems simply by connecting the audio and video cables. This can be done by any user and requires no extra hardware or extra costs (other than the necessary cables to hook up the equipment). Q: Can I use my standard controller or joystick with the simulator? A: Yes. You can use nearly any type of input method you'd like with the simulators. The simulators don't limit your gaming choices, they expand them. Q: What kinds of displays are supported? A: Virtually any type of display you can think of can be used with the Home Simulators. We have tested CRT Monitors, Tube Televisions, Overhead Projectors, Plasma TVs, LCD TVs, LCD Monitors and more with our home simulators and each of them works wonderfully. You can even use video goggles and other types of displays. Q: How heavy are the simulators? Q: What are the dimensions of the simulators? A: The Home Pro Racer (HRS) measures approximately 60" long x 50" tall x 32" wide. Q: How are the simulators packaged and delivered? A: The Home Pro Racer is carefully wrapped in shrink-wrap to secure all parts and protect the body. The shrink-wrapped machine is then fastened to a wooden pallet and boxed up in a thick, protective crate. All parts are securely fastened and the machine is then shipped via freight by truck. Because of the weight and massive size of this game, inside delivery is strongly suggested. Q: What kinds of cables come with the simulators? A: The cables that accompany the simulators depend on the accessories purchased. If you purchase a Pro System Package, for example, with the gaming console and display, you'll receive all of the cables you need. If your purchase the base model, however, you will receive the digital optical cable and shaker cables (RCA). All accessories include the cables necessary to use them. Q: What makes your simulator better than others? ● Pure Digital Surround Sound (5.1), with 1000 watts of power for the ultimate reality. ● Three force feedback rumblers put you in the game. ● Elevated seat for realistic positioning. Race drivers don't sit three inches off the ground. ● Control the vibration or Adjust the wheel. It's up to you. Our simulators are built for the whole family ● Unlike many simulators, our systems are built to work independently of the gaming system. You can easily run different consoles or even run multiple consoles on one simulator! Q: What kind of warranty comes with your simulators? 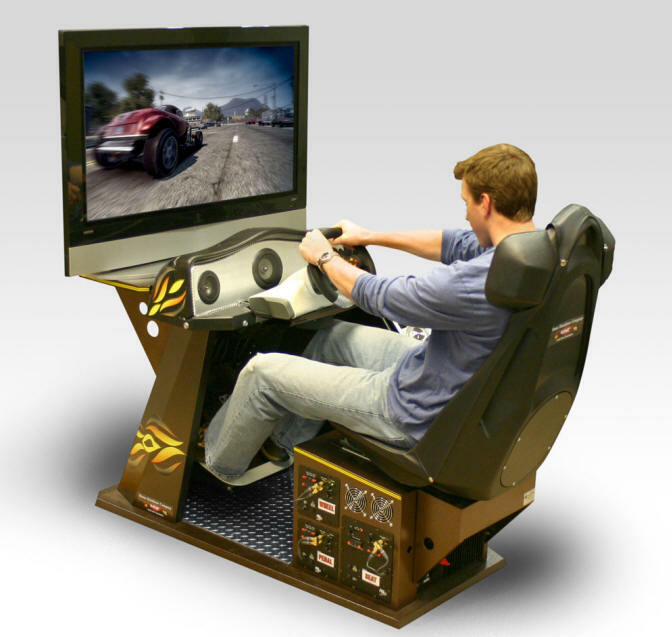 A: The seat, frame and body of the simulators are covered by the manufacturers six month warranty, and all the electronic circuit board within the Home Racing Simulator (excluding all gaming consoles/computers) are covered with our FREE Two (2) Year Limited Game Electronics Warranty. 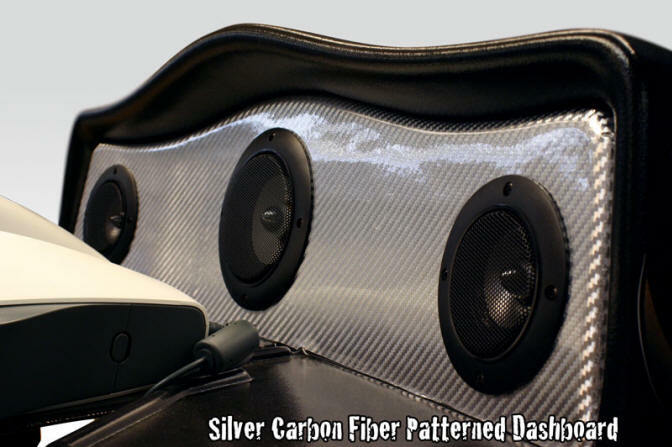 Third party accessories, such as steering wheels, speakers and displays are covered by manufacturers warranties. Q: What if I need technical support or help with my simulator? 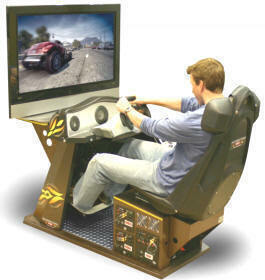 Click here to see more Video Racing Simulators and Racing Games !